On Thursday afternoon, representatives from six local school districts joined organizers, Mark and Virgie Hunter of the Steven A. Hunter Hope Fund, for a training session led by Heidi Becker from the Freesource Foodbank. The session was held at Coffee @ the Lofts owned by Terri Ockerman in Portsmouth. A box lunch was provided to the group by Market Street Cafe while they learned more about the additional program, Steven’s Power Pantry. Many have heard of the Steven A. Hunter Hope Fund or participated in one way or another in its Power Pack program. The Power Pack program serves students attending public schools in our area by sending a supplement of food home with students. Mark and Virgie Hunter along with the many volunteers of the program had received feedback that the children were sharing the Power Pack supplement at home with other family members so they started looking for ways to serve the other family members. Steven’s Power Pantry was the result of that need. It is held outside of school hours and the student or parent can pick up the food. The pantries are operated by volunteers from the school’s community. Northwest local schools started a program with grant funding and the assistance of Mark and Virgie Hunter about four years ago. The six schools opening a Steven Power Pantry soon are Bloom-Vernon, Sciotoville Community Schools, New Boston, Portsmouth City Schools, Valley, and Portsmouth West Schools. “The budget was built around a $25,000 grant received from Walmart in 2017,” according to Mark Hunter. The grant offsets about 64 percent of the estimated annual budget for the six schools to be funded for the Steven’s Power Pantry. The other funds are supplemented from donations to the Hope Fund. Food wise, the program is at no cost to the local school. The volunteer’s time invested back into the children is the only cost they experience. He expressed gratitude to the community on how well they help support the Hope Fund and local school children. Partnering with the Freesource Foodbank, it purchases a lot more food than if they would make in store purchases. Mark Hunter built into the budget, an expense allowance per school, to allow for shelving, refrigerators and what the school needs to build the dedicated space for the pantry. Not only does the Hope Fund cover the expense but they make the purchase and join the school’s volunteers to set it up. Part of the Foodbank program analysis is based on “unduplicated” children. That means if the child is served at least one time during the school year then it counts as one child, even if they move away. If a child joins after the start of the program then it is another child served. By the end of the school year the program will usually see an increase of at least 10 percent or more in “unduplicated” children according to Hunter. “Northwest started with 15-20 families and are now serving about 50 families,” Hunter said about their success. Volunteers are important to the success of any program, so if any community members are interested in volunteering please contact your local school district. Non-perishable food donations are accepted by each of the seven schools. They advised to contact the school about donating to the pantry. Hunter expressed he is excited and hoped it will have the impact that he has prayed it will have on the communities. 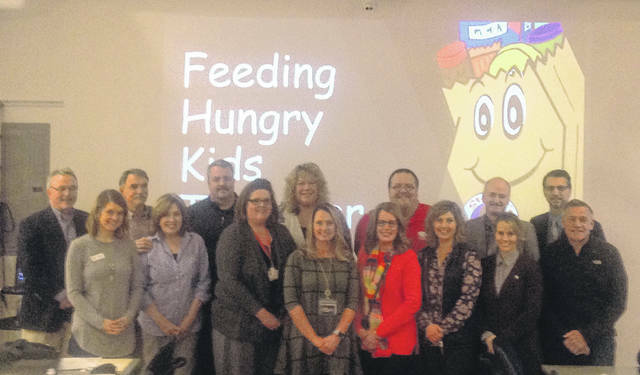 Through the Power Pack program, it became obvious to the volunteers at Minford and again at South Webster schools they had a need for year round program. The participating schools in the pantry would have access to a summer food program and be eligible for the fresh produce program by participating in the pantry program. During the summer program, South Webster teachers volunteering said they liked staying in touch with the students and have access to a parent that they may not have been able to get in touch with during the school year. According to Slack they have volunteers from churches, our school, community and just whoever can volunteer. On the other side of the county Chris Jordan, Principal of Portsmouth West Middle School shared the same enthusiasm about the program. Portsmouth West has participated in the Power Pack program for three years. “One of the reasons we chose this additional program is we were already providing to our older students through teachers bringing things in so this will help provide to the students even more,” said Keri Bivens, Literacy Coach and Student Growth Manager of Portsmouth West Middle School. All in attendance confirmed the need of local students and their families. A resounding concern came from the room for older children to be served with a food program. “We are excited to start the program at Valley because it will allow us to serve our high school students, also,” said Aimee Elswick, Instructional Aide at Valley Schools. In closing, Mark Hunter gave assurance to the attendees about his and Virgie’s participation in getting the program started at their schools. To make a donation directly to the 501C3 Steven A. Hunter Hope Fund please send by mail to Steven A. Hunter Hope Fund, P.O. Box 802, Portsmouth, Ohio, 45662 or use the donate buttons through paypal on Facebook or at www.stevenshopefund.org. or to donate to your local school’s food pantry please contact the school administrative office directly.